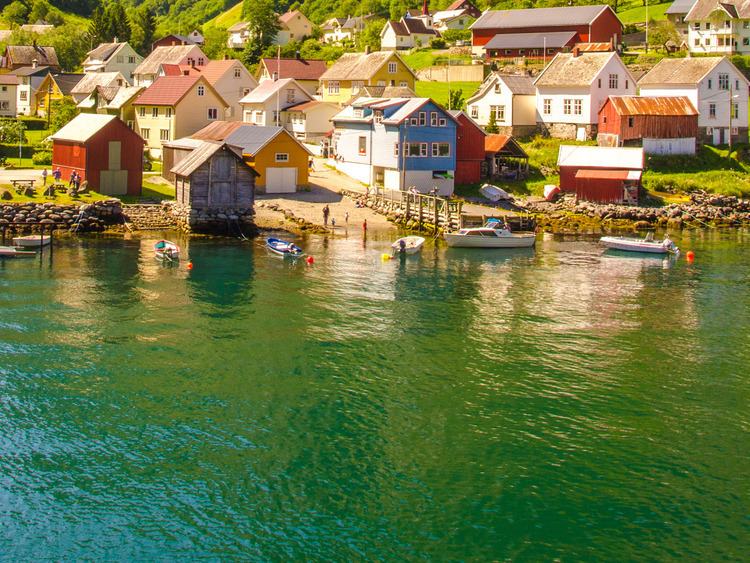 A thrilling trip that takes us along the Nærøyfjord by boat, through the picturesque villages of Gudvangen and Stalheim, where time seems to stand still, then into the surrounding steep mountains up which the breathtaking roads struggle to climb. An adventure not to be missed! We will leave from Flåm, on one of the inner branches of the Sognefjord (which, extending more than 200 km inland, is the longest fjord in Norway), and travel the inner edge of the Aurlandsfjord by boat. The word "fjord" is of Norwegian origin and indicates a marine cove of glacial origin that is usually narrow, with steep shorelines that extend below sea level. We will then continue along the Nærøyfjord which, due to its geological features and the incomparable beauty of its natural landscape, was made a UNESCO World Heritage Site in 2005. We will move slowly on across the fjord, which is 17 km in length and roughly 500 m deep, and surrounded by the steep slopes of the mountains (up to 1400 metres), passing waterfalls and navigating narrow sections (the narrowest measures 250 metres). Having reached the edge of the fjord, we will disembark in the small village of Gudvangen, where we will board a coach. Our tour continues through the Nærøy valley, descending down thirteen steep hairpin bends along the Stalheimskleiva road. Approximately 1.5 km in length and built in 1849, the road is flanked on both sides by a series of waterfalls. After a stop to admire the view of the wide valley below, we will return to Flåm, retracing the Nærøy valley and crossing a long series of tunnels. This excursion is not recommended for guests who suffer from seasickness or guests with mobility problems. The boat has seats inside and outside; in the event of inclement weather, you are advised to bring a raincoat and wear appropriate clothing. In the event of adverse weather conditions the Stalheimskleiva road may be closed. In this case the tunnel road will be used in both directions.